Germany's Volkswagen is the largest car maker in the world, after Toyota. Its 590,000 employees produce nearly 41,000 vehicles daily. It currently owns 12 subsidiaries including Volkswagen Passenger Cars, Audi, Seat and Skoda, luxury brands such as Bentley, Bugatti, Lamborghini, Porsche and Ducati - as well as Volkswagen Commercial Vehicles, Scania and Man. 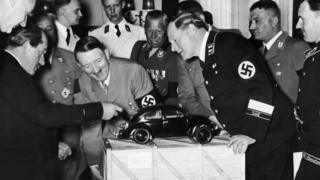 It is a long way from its origins as part of Nazi leader Adolf Hitler's vision to enable German families to own their first car. It also owes its post-war existence largely thanks to the initiative of a British army major, Ivan Hirst, who saved it from being dismantled and sold off after World War Two as part of war reparations. Here are some of the key points in Volkswagen's 78-year history. 1937: The company is set up by the Nazi trades union organisation, the Deutsche Arbeitsfront. Very few Germans owned cars at the time, and the aim was to create a "people's car". Hitler decrees that the car should carry two adults and three children at 100km/h (60mph) and that it should be cheap, costing no more than a motorbike to buy. Largely designed by Ferdinand Porsche, the KdF-Wagen (Kraft durch Freude, or "strength through joy") has an air-cooled rear engine, torsion bar suspension, and an aerodynamic "beetle" shape that is important given its small engine. 1938: The company, initially called the Gesellschaft zur Vorbereitung des Deutschen Volkswagens mbH, is renamed Volkswagenwerk GmbH. 1938: A factory is built for the company in the new town of KdF-Stadt, now modern-day Wolfsburg. Some 336,000 people subscribe to buy the car via a monthly savings plan but by the outbreak of war only a handful of cars are complete and none are delivered to customers. 1939-45: During World War Two civilian car production ceases and the firm switches to making vehicles for the German army, using more than 15,000 slave labourers from nearby concentration camps. It is a practice that is widespread among German firms during the war. In 1998, survivors file a lawsuit against VW, which sets up a restitution fund. May 1945: The heavily bombed factory comes under British military control, to be used as an army maintenance depot. August 1945: Under the terms of the Potsdam Agreement between the USSR, USA and UK, the plant is liable for dismantling as part of war reparations because it had been used for military production, but British officer Major Ivan Hirst persuades his commanders of the potential of the car. September 1945: The British Army places an order for 20,000 vehicles to meet its own needs running post-war Germany. 1946: Production reaches 1,000 vehicles a month, and the car and company are renamed Volkswagen. 1948: The British Army offers the plant to representatives from the US, Australian, British, and French motor industries - but all reject it. Ferdinand Porsche's design company, which eventually becomes Porsche itself, is paid a licensing fee by VW for use of the Beetle. Over the coming decades, the Porsche and VW companies will remain linked via a complex legal framework. 1949: Volkswagen passes to German control under manager Heinrich Nordoff. It becomes an important element of post-war West German regeneration. The state of Lower Saxony, where VW has its main factory, takes a 20% voting stake in the firm. 1955: As production increases dramatically, sales of the Beetle reach one million. 1964: Volkswagen buys Auto Union, owners of the historic Audi brand. 1969: VW buys NSU Motorenwerke, and eventually merges this with Auto Union to create the modern Audi firm as its luxury vehicle brand. Audi has the technological expertise needed as demand for VW's original air-cooled models goes into reverse. 1973: With sales of Beetles declining, VW switches to an new generation of cars with front-wheel drive and water-cooled engines - the Passat, Scirocco, Golf, and Polo. 1975: VW Group is created as a holding company for the growing car maker. 1982: VW signs a co-operation agreement with the Spanish car maker Seat. It buys a majority share in 1986 and acquires Seat outright in 1990. 1991: VW signs a co-operation agreement with Czech car maker Skoda, which then becomes VW's fourth brand as it raises its equity share to 60% in 1994 and 70% in 1995. 1998: VW embarks on a round of acquisitions of famous names, buying up Britain's luxury car maker Bentley, France's Bugatti and Italy's sports car maker Lamborghini. 2005: Porsche increases its 5% stake in Volkswagen to 20%. At the same time, the European Commission takes Germany to the European Court of Justice, claiming that the "Volkswagen Law", which prevents any shareholder in Volkswagen from having more than 20% of the voting rights in the firm is illegally restricting the flow of capital in Europe. 2007: Porsche increases its stake in VW to 30.9%. 2008: Porsche fails in its attempt to acquire the much larger VW, leaving Porsche itself on the edge of bankruptcy. 2009: VW buys a 49.9% stake in Porsche's car making business for €3.9bn but the two firms are later forced to call off a planned merger because of legal risks. 2012: VW's Audi subsidiary buys the Italian motorbike maker, Ducatti. 2012: Years of wrangling between the two firms - and families - comes to an end when VW buys the remaining half of Porsche's car making operations. Porsche's chairman, Wolfgang Porsche, has ultimately been thwarted by his older cousin, Ferdinand Piech, who is VW's chairman. 2013: Germany wins its court battle with the EU over VW, after rewriting the Volkswagen Law. Under this revised law, for important decisions an 80% majority of all shareholders will be needed. 2014: Volkswagen is one of the biggest firms in the world. It has factories in 31 countries, and its products are sold in 153 countries across the globe. 2015: The company admits cheating emissions tests in the US. According to the Environmental Protection Agency (EPA), some cars sold in America had devices in diesel engines that could detect when they were being tested, changing the performance accordingly to improve results.